Putting the Right Plant in the Right Place for the Right Purpose with the Right Management can extend the growing season, increase profit, reduce risk, reduce salinity, maintain ground cover and make perennials persist. Achieving greater profits from perennial pastures balances stocking rate and lambing date to consume more of what is grown. The aim is greater product (wool and meat) per hectare. 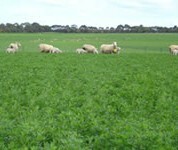 Lucerne reduces risk, provides options for livestock and prevents salinity. Shelter from perennial grass hedgerows or shrubs can improve lamb survival, especially for lambs born as twins or triplets and at times or in areas with a high risk of chill. Summer active tall fescue provides autumn feed in poorly drained soils. 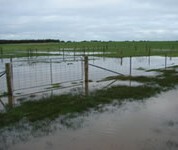 EverGraze systems have potential to reduce salinity risk in the Wannon catchment. All perennials except kikuyu and chicory persisted for more than seven years from putting the right plant in the right place with the right management. Triple (lucerne, perennial ryegrass and summer active tall fescue) and Ryegrass (early, mid and late finishing perennial ryegrass) pasture systems produced 8-12 tonnes DM/ha/year. Lucerne and chicory produced 1-3 tonnes DM/ha over the summer period. Stocking rates were 25-31 DSE/ha from 2006-2010 compared to 16 DSE/ha for the average benchmarked South West Farm Monitor (SWFM) farm over the same period. Average lamb weaning percentages were approximately 92% for Merino ewes and 141% for Coopworth ewes compared to 80% and 118% for the average South West Farm Monitor. 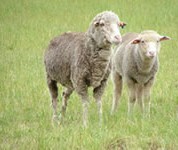 Profit of Coopworths and Merinos were similar despite the lower weaning percentages from Merinos. Twin lamb survival increased by 15% when lambs were given shelter. Wool production varied with the sheep system from 35-64 kg clean wool/ha compared with 35-46 kg clean wool/ha for the South West Farm Monitor top 20%. Lamb production ranged from 351-774 kg/ha compared with 215-374 kg/ha for the top 20% South West Farm Monitor. Beef steer live-weight production per hectare ranged from 644-928 kg/ha compared to 579-732 kg/ha. 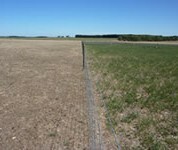 Including lucerne in the Triple system reduced supplementary feeding cost compared to the Ryegrass system by $20/hd or $300/ha over the 2007 summer following the 2006 drought. Average gross margins of $617/ha (Triple system) and $564/ha (Ryegrass system) exceeded the top 20% South West Farm Monitor prime lamb production systems ($484/ha) by 16% and 24% respectively, and the average system ($282/ha) by more than 100%. Internal rate of return from establishing EverGraze systems on 10% of the farm is estimated to be 10-27% with payback of 6-7 years. Post-experimental modelling confirmed higher profits of $512/ha (Perennial Ryegrass System) and $499/ha (Triple System) compared to $12/ha for a base-case traditional south west region wool production system. Measurements of water use confirmed that on the crests, lucerne fully controlled water loss below the root zone. Chicory also controlled leakage until its density declined three years after sowing. Tall fescue and perennial ryegrass used more water on the valley floors compared to annual pasture. Improved dryland pastures for sheep and beef cattle production in south-western Victoria are typically based on summer-dormant cultivars of perennial ryegrass (Lolium perenne L.) or phalaris (Phalaris aquatica L.)…. Can summer-active perennial species improve pasture nutritive value and sward stability? 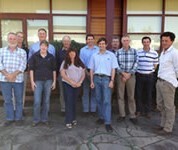 Overview on the EverGraze Hamilton site in Victoria with David Robertson, EverGraze SW Advisory Committee Chair. Soils: Brown Chromosols derived from Quaternary basalt and form three distinct landscape units: the crests, slopes and valley floors with clay content increasing and drainage decreasing down the slope.